New ebook for Kindle: “Kitty with the big balls” by Frank Madsen and Sussi Bech. The inconspicious, unconventional picture book “Kitty with the big balls” follows Kitty’s struggle to survive in a hostile and unfair environment that demands that he work for food. Kitty is a proud and free but somewhat lazy, uncastrated male cat. His main assets are his free spirit and his big mojo. In the end Kitty comes out triumphant. 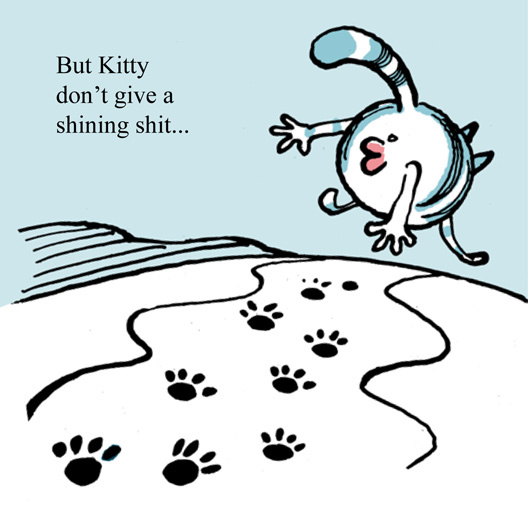 “Kitty with the big balls” can be bought from Amazon (Kindle edition). Kitty is a character from Frank Madsen’s and Sussi Bech’s weekly comic strip, Ex Libris, that appears every Friday in the literary supplement of Weekendavisen, one of Denmark’s most respected newspapers. The strip satirizes everything in the swank world of literature: the authors, the publishing houses, the bookstores, the librarians, and – the readers. Created in 2009, the weekly comic strip the size of a american Sunday strip has been immensely popular and has so far had its entries reprinted in eight book collections. Kitty’s picture book is for sale as a printed version as well, but only in German and French.